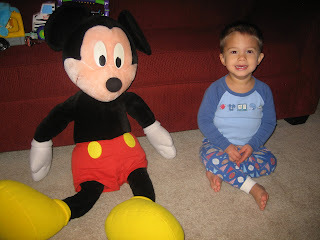 Connor really likes reading with little Mickey and playing with big Mickey. Connor tries to drag the big Mickey around and loves it when Daddy and Mickey chase Connor around the house. 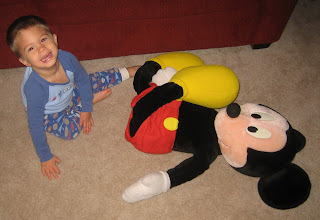 He really gets a kick out of it and I think he believes that Mickey actually comes to life to play with him. awwwww-so good to see him running naturally again!